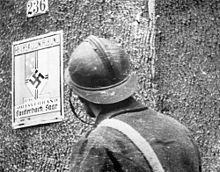 The Saar Offensive was a French ground offensive (attack) into Saarland during World War II. It was done from 7 to 16 September 1939. This area of Saarland was defended by the German 1st Army. The purpose of the attack was to help Poland, which was under attack at the time. The offensive was to have been done by 40 divisions, including one armored division, three mechanised divisions, 78 artillery regiments and 40 tank battalions. The offensive was stopped and the French forces eventually retreated when the Germans attacked them on 17 October. This page was last changed on 23 August 2018, at 07:46.